Summary: Ruth Law loved to entertain crowds with her daredevil flying, but after four years of shows, she was ready for a new challenge. In 1916, she decided to fly from Chicago to New York City, which would set a new American record for nonstop flight. Although she had never flown more than 25 miles, Ruth was a mechanical whiz, and set about modifying her plane to get it ready for the journey. She also cut a map into strips and put it on a roller. She had to have both hands on the controls at all times, but managed to maneuver one control with her knee when she had to turn the roller and find her way. (Kind of like those drivers who talk on their phones with one hand and hold their Slurpees in the other) Flying in a 50-mile-per-hour late November wind, she made it as far as Haskell, NY before she ran out of gas. That was enough for a new record, though, and the next day she landed in New York City, gliding past the Statue of Liberty before landing in the midst of a cheering crowd. Grades 1-4. 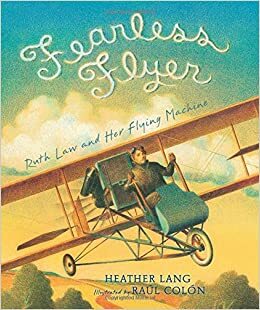 Pros: Heather Lang tells a fascinating story of an early aviation pioneer, with relevant quotes from Law interspersed throughout the text. The illustrations capture the feel of flying in a primitive airplane, low enough to the ground to be able to navigate with a map. Cons: This is mostly the story of a single flight, not a complete biography of Ruth Law.